Currently on my wishlist is a customized front-end for Validator.nu. Bootstrap, JQuery and Prism (for syntax highlighting). > Currently on my wishlist is a customized front-end for Validator.nu. One little suggestion based on a glance (will look closer later): somehow indicate which schema version is current. the "address" term on the pop-up is confusing; maybe better as "link"? my example had only one error, which makes this incorrect: "Oops, I found 1 errors." Maybe change last word in template to "error(s)"? And just a question: does this include a web server aspect? If yes, I say we move it to the main site, per your suggestion. I decided to use the same terms as used on validator.nu, but yeah, "link" or "URL" might be clearer. It's currently just a HTML page hosted on GitHub Pages. Validation happens at validator.nu via their REST API. One could imagine expanding the page with additional checks that rely on XML parsing (e.g. to help users follow all our CSL repository requirements), which might require a server. 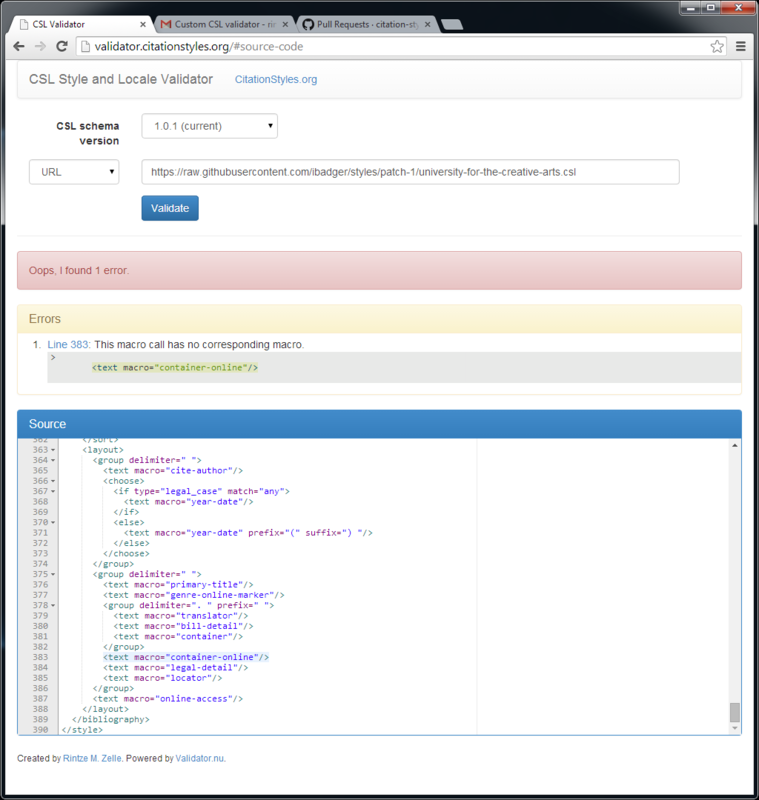 Also let me know if you have any ideas on how to further improve the validator. Thank you Rintze, I like it! c) is the code available? > Also let me know if you have any ideas on how to further improve the validator. > Thank you Rintze, I like it! > c) is the code available? not a very experienced web developer. * Certainly +1 for some sort of "busy" indicator. I would say a disabled (gray) "Validate" button with a spinning circle. I think it should be displaying the full preceding and following lines instead of chopping them off. * How about having it tidy up the formatting as well? E.g. fix indents (both amount of indenting and spaces instead of tabs), spacing before />, etc. * Would be awesome if you could directly create a pull request against some style in the repo (e.g. have a field where you could fill in the file name [with suggestions as you type, of course] for an existing style and then click a button to create request. A drop-down with all styles might be a bit too much to handle). I think that might be related to what Carles had in mind with the link generation. > (gray) "Validate" button with a spinning circle. > * The context that it displays for errors is a bit awkward. E.g. > instead of chopping them off. lines from the full XML document, but that's a bit of work. validator test for them, but still allow them per the CSL schema. > amount of indenting and spaces instead of tabs), spacing before />, etc. the line highlighting (since tidying can move the XML code around). library that does XML tidying? > mind with the link generation. and it should be possible to automate some of this. inactive and show a spinning wheel. parameters and use them to prepopulate the input selections). File upload could be manageable if you read the file contents  before submitting the form and then submit it as text. Unfortunately, reading contents from links might be more problematic due to cross-origin restrictions. You probably won't be able to do this without some sort of server-side proxy. parameter is set. Upon validating by URL, the "url" and "version"
the "url" and "version" parameters are removed from the URL.